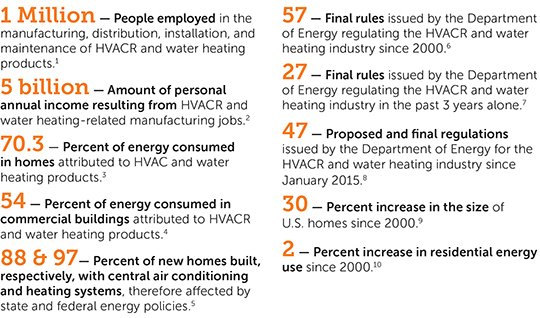 AHRI helps educate policy makers at the federal, state, and local level on important issues related to the HVACR and water heating industries. This annual contest challenges AHRI member companies to host legislators at their manufacturing plants, visit federal, state, and local government officials, and host talks and events for students pursuing careers in the industry. View more here. 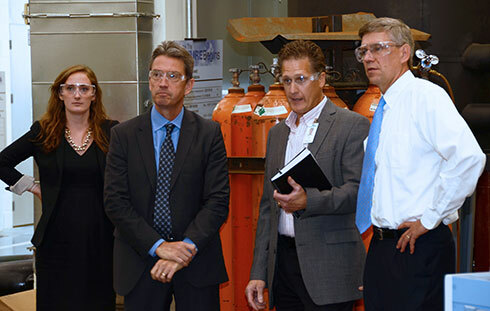 Congressman Erik Paulsen (MN-3) tours the Daikin Applied headquarters in Plymouth, Minnesota. AHRI is a strong supporter of regulation based on sound economic analysis with strong federal preemption and efficient compliance mechanisms. AHRI is concerned that the recent pace and cost of regulations will stifle growth and job creation, while not actually achieving the energy savings goals established for the regulations. AHRI members' products are regulated by the Department of Energy (DOE). This agency is legally obligated to conduct rulemakings on a Congressionally mandated schedule. Our members depend on a predictable federal efficiency standards review schedule. AHRI supports reform of the 40-year-old Energy Policy and Conservation Act, which establishes one national standard for manufacturers instead of many different state or municipal standards, as well as federal preemption. These components provide predictability for manufacturers, but the legislation is outdated. Contact AHRI’s Government Relations team or Senior Vice President of Public Affairs Francis Dietz for more information.